Malaysian Defense Minister Mohamad Sabu of the new Pakatan Harapan-led government revealed to his parliament on July 31 that only four of the 18 Sukhoi Su-30MKMs of the Royal Malaysian Air Force (RMAF) 11 Squadron are airworthy. He added that the previous administration had terminated the original maintenance contracts, and the new government is looking at engaging local contractors. In a response, the RMAF said that, since 2007 and the delivery of the first batch of Su-30MKMs, the budget allocated by the government has been lower than the expected figure required to maintain the entire fleet. 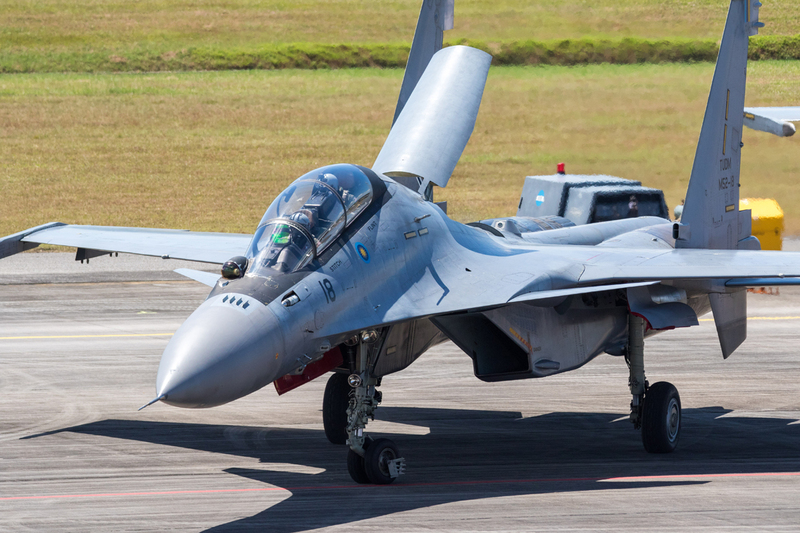 Malaysia’s Sukhois are in the process of reaching their 10th anniversary in service, which requires a mandatory depot level check recommended by the OEM. This would also require the Su-30MKMs to be flown to Russia for these checks, and current funds do not permit such tasks to be carried out. The high costs imposed by the OEM have forced the RMAF to seek alternative solutions such as engaging local industries for collaboration to reduce dependency on Russia. The RMAF reported that 12 Su-30MKMs have reached the said 10-year lifespan, and pointed out that finding alternative solutions to OEM support takes time and funds. This has resulted in only four to six Su-30MKMs being available to defend the eastern Malaysian peninsula. With another five of eight 18 Squadron F/A-18D Hornets deployed to Australia for Exercise Pitch Black, Malaysia now has no more than nine airworthy airframes in-country for air defense missions, and possibly as few as seven. The 10 MiG-29Ns that were delivered to Malaysia in 1995 were withdrawn from service last year.